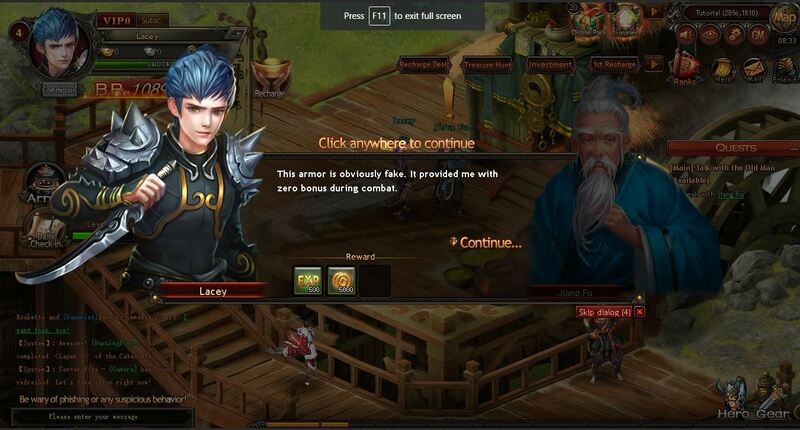 Dragonbone Dynasty is a relatively new RPG game that is exclusively on PC. The very first thing I enjoyed was not having to wait hours for a game to download because you can play the game directly through their website. It took less than 5 minutes to go on the site, create an account, and start playing. When you first start the game, it gives you the choice of a few different characters to play from. They all look uniquely different which I think speaks to the creativity on the game designers. Each character also has different base stats, starting gear, and different fighting abilities. After you create your character, you choose a name and load into the game. Like most all RPGs, you start the game with a simple quest that allows you to gain some easy currency and experience for your character. 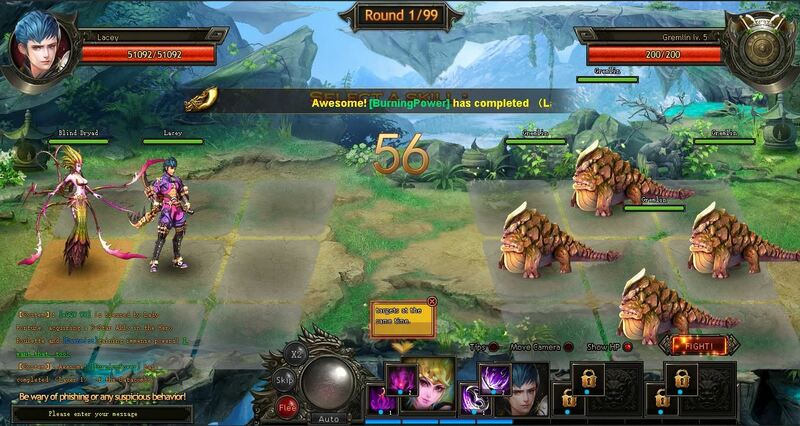 When completing the first few quest, the game auto paths to help you complete the quest and fast as possible. I really like this to start out a game because it doesn’t allow for new players to get lost, or not know where to go next. But, for those who seems to get a quick grasp on the game can simply turn off autopathing by clicking anywhere on the screen. But don’t worry, if you accidentally turn off the pathing, clicking on the quest will turn it right back on. Now let’s talk about in game combat fighting. The combat that occurs in the game is not very unique, but still is very enjoyable. 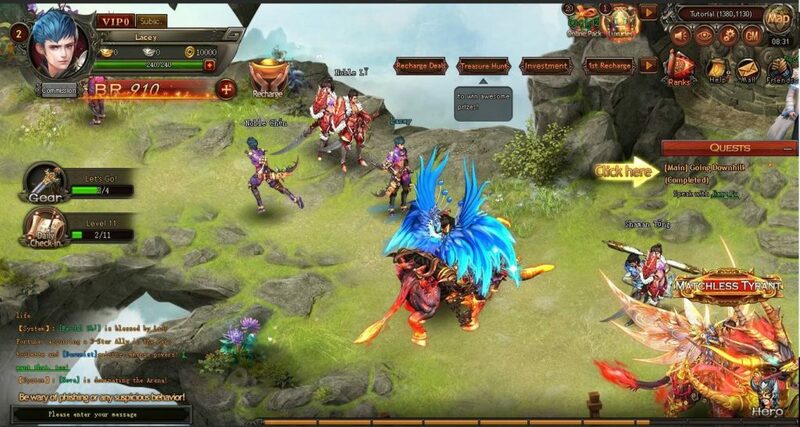 It is simple turned based combat where you choose the abilities of you and your allies to defeat the team of enemies you’re facing. Like I said before, each character has their own unique abilities that do add some creativity to the combat if you play the different types of characters. The first few fights, the game tells you what abilities to cast to help wipe out your foes, but as the game goes on, you have to decide for yourself based on the enemy you’re facing and your combat stats on what abilities you should be using. I could very well see how the combat does get difficult as the game goes on when there are so many different combinations of abilities that both you and your enemies can use. So we covered the base of how the game works and how it does have some unique aspects to it while still staying true to an being an RPG. Now its time to give an honest review of other aspects of the game that I think is important to having a successful RPG. Although the graphics are not 100% ideal, I have also seen plenty worse from other similar games. I do appreciate the attention to detail when it comes to multiple things in this game such as background scenery, the look of player abilities when fighting, and the creativeness of the armor and weapons on all the different NPCs. That being said I am pleasantly surprised about how smooth the game actually is. I do not use any super computer setup, but I was able to run the game without any issues at all. That is very surprising for a game that didn’t have to be downloaded on the PC and you can just play it from your web browser. OK now lets review the plot you’re supposed to be following and how it stacks up to other very popular RPGs. Being an RPG fan boy, this game did not disappoint me as much as I originally thought. I was very skeptical coming into the game thinking it would just be another very simple and boring plot. But, I actually took the extra time and read all the dialect and the creators did not disappoint. Final thoughts and do I recommend this game: Overall, I was not disappointed in this game. If I had more free time on my hands I could see myself playing this more. There are a lot of positives about this game. I would like to see how much more the story of the game develops and if any changes are made over the next few months. The only true negative that I did not mention this review was that there are some pay to win aspects of the game that I just do not enjoy overall from games. But, if you’re looking to try something new and play a fun game for free this one is for you! Looks interesting, I love to play games but it has been a long time since I have played on the computer! Thank you for sharing such a thorough Dragonbone Dynasty Review. This looks like great gameplay ,with awesome back story ,always good for gameplay!